I’ve been putting this off for awhile. Days, then weeks and finally months because I didn’t want to admit it to myself. Like a spouse in an unfulfilled marriage, I just kept going along because I feared change more than a stagnant lifestyle. While melodramatic that’s basically how Yugioh has been for me since YCS Secaucus way back in May of this year. Konami made the correct decision to ban Master Peace, the True Dracoslaying King and with it killed my ability to win at the game with relative ease. Ever since then I grew more and more frustrated as my tier one deck became a high functioning rogue deck. To make matters worse, the community further deteriorated due to new time rules at events, toxic gameplay and unsurprisingly far greater powercreep. However, I’ve been feeling hostile to not just Yugioh, but Magic the Gathering also. I feel obligated to force out an event summary for the last three events I went to because they both changed my opinion on the game. That being said as a basic TLDR for everyone in case it was not obvious: this blog is probably dying because I’m tentatively done with card games. And while you can easily just say “ah you’re quitting because you’re bad at the game” I don’t see it that way actually. I see it as I have a ceiling with which I’m willing to play the game. I never play-tested online since coming back into the game competitively a few months ago because it’s not fun for me. I never go to locals because the uber ride is expensive and I honestly have disdain for the players at said locals. For these reasons I admitted to myself that I would have a hard time beating players who made this game their life. I got as far as I did mostly from a solid understanding of my deck and frankly in hindsight luck. Masterpeace was a win condition. Most games pre-banlist were basically just… did they have an out? Without him everything became hard. Maybe my lack of practice finally got me, but I definitely didn’t win as often playing floodgate control despite how good Dinomight Knight is. Anyway, I should turbo through these events already. Luckily, since they maybe my last post I have pictures to offer! This was an event that we drove too following the release of Dark Saviors. Two of my friends had the deck while I was playing True Draco. I won’t lie. I really wanted to play Sky Strikers. I think the deck is really cool, but I was not willing to pony up the $500 needed to get 3 copies of Sky Striker Mobilize Engage and 3 Sky Striker Mecha Widow Anchor. This tournament (right in my home state actually) would be the beginning of my downward spiral toward hating this game. No Yugioh player ever wants to play against Chain Burn. Much less in the first round of an event when you’re not expecting it. Game 1 I lost to getting burned out. Games 2 and 3 I made a lot of cute plays to avoid burn damage (like using Waterfall of Dragon Souls to sack off my targeted monster to draw cards! ), but game 3 he still managed to ruin my day. This matchup was my first time seeing how hard the pure sky striker matchup was. Basically if they resolved Afterburners the tempo loss actually just wrecked me. Anti-spell wasn’t even good enough since my deck couldn’t even OTK. Game 1 he wipes out all of my cards so I lose. Game 2 I somehow outgrind him and win. Game 3 I narrowly beat him in a simplified gamestate. This was a horrible match or rather game. This guy was playing the trap Scrubbed Raid (named appropriately for any player actually using it) he was able to engineer a gamestate totally by accident due to his annoyed demeanor where I could never attack, but he could never out my board. In hindsight I should’ve surrendered because we started game 2 as they called time in the round so I lost. This was the only match of the event that made me happy. I was able to resolve Mettatron the 12th the true dracocombatent to summon Superheavy Samurai Steam Train King. He ran over his Ether, the Heavenly Monarch and then banished my opponent’s graveyard for over 4000 damage total. There was somehow a repair this round as if to add insult to the injury that we were playing Yugioh at 9pm despite the new EOM procedures. I beat my opponent in 2 fair back and forth games. Nothing much to say here. I might as well give my thoughts on the end of match procedures now since they were first tested at this event and I sent the day discussing them with many players and even a judge. Every player I spoke with hated them. The judge liked them. I felt that they had a good intention, but failed to do their job. Matches still went into overtime that lasted up to an hour. Players began to side deck burn cards just so they could win in whatever phase time was called in. The worst part is that they caused players to game the system by slowplaying. I agree fully that something has to be down to make Yugioh events not end at midnight, but that the new rules at their onset totally failed to do so. My opinions actually changed as I write presently, but more on that later. As a final aside I want to shoutout my friends at Drexel who won the School Duel on Day 2 of the YCS, my parents for letting us spend the night at my old house after day 1 and this one dude I ran into cosplaying Weevil Underwood at the venue. Following Secaucus, my group united to go to ARG Atlantic City since one of our friends had a contact who could get us a free hotel room for one night. We went in Friday night and had one of most fun nights of Yugioh goat control, beer and debauchery that I’ve ever been a part of. It was truly superb. I don’t think I’ve ever posted about it on the blog, but I love Yugioh goat control. It’s all that I love about the game. It’s a back and forth, slow grindy format where card advantage and value matter the most (or just jamming like a madman and hoping you win). I would go more in-depth, but this is already likely going to be my longest post so let’s just call it “old school” Yugioh, but an actual competitive format. My friends and I play it often to unwind and gamble a few bucks! So by this point the format was solved with Gouki and Trickstar Sky Striker as the two best decks. My draco deck on the fringes once more, I tried to jam as much hate for the meta decks as possible. Game 1 I did beat my opponent off the back of floodgates. Game 2 we entered a grind game and I lost. Game 3 I made a single misplay by killing my opponent’s Decode Talker instead of their hornet bit token (which I thought was a Phantom Skyblaster token). This gave them the ability to out my board and beat me. This match taught me that the Sky Striker match-up was indeed winnable, but that I could not make a single mistake at any point or else I would auto-lose. We grind game 1 and I won in the end. He takes game 2 and ultimately beats me in time game 3. Despite winning this match I was so frustrated I dropped from the event after this round. I was given access to unlimited side events so I ended a win a mat while my friends continued in the main event. I think I tweaked my deck, but all I remember is putting Inspector Boarder in the side deck. I gave my opponent the utmost respect and did everything in my power to utterly destroy him. He was taking advantage of Neo Spacian Grand Mole at 3 and used it to bounce my monsters, but he couldn’t keep up with me in damage output both games. I had the most outlandish talkative opponent this round (which I only won due to the dieroll). Game 1 we grind and I win. Game 2 I flip Rivalry of Warlords and he fails to out it. We had so much witty banter that you would think we were old friends and not tournament rivals. He said and I quote, “I thought we were friends!” in response to me flipping up Rivalry. It was a surprisingly fun experience that never expected to have playing against an FTK deck. Game 1 he starts to out advantage me so I scoop. Game 2 I beat him using Inspector Boarder which locked out his monster effects. Game 3 he plays right into my Evenly Matched and never recovered from it. And so I won the event and received the 2016 ARG mat! I actually really like this mat (I’m a sucker for stained glass!). This was my highlight of the actual ARG and my best tournament result in the last three months of Yugioh). Last thing to note was that after my friends also scrubbed out we had another night of Yugioh, beer and goats (in a new hotel room) which was once again amazing! We ended up playing goats so late that night that we gave up on attending the Day 2 of the ARG and went back to Philly after sleeping in. And we’ve reached it the highest tier of Yugioh and personally I first time in my life I really traveled for it. We went to Fort Worth Texas for the World Championship Qualifier! While there I ended up making a crucial mistake which allowed me a major insight as a Yugioh player and as a human being. So one of friends after failing to win the Last Chance Qualifier at YCS Secaucus allowed me to borrow his expensive Trickstar Sky Striker cards so I could play the deck. Basically to make a long story short I was awful with the deck (that I picked up the Thursday night before we left for Texas. I couldn’t win a single game and got overly frustrated even trying to play the deck. My lack of playtesting combined with my disdain for the deck’s playstyle got me burned out (no pun intended) on it after barely an hour of practice. And then after round 1 of the North American World Championship Qualifier I dropped from the event and sold all of my expensive cards to the vendors. Travelling halfway across the country to play Yugioh and then basically rage quitting immediately? I know it sounds pretty bad, but I realized that if I wasn’t having fun there was literally no reason to play. I wish I had just played True Draco wherein even if I lost I’d at least enjoy the deck that I was playing. Trickstar Sky Striker with proper practice would’ve likely allowed me to do well at the event, but as I never bother to practice anyway there really was no chance of that. And with my Ash Blossoms, Borreload, Isolde and Saryuya Skull Dread all sold my foray into competitive Yugioh had at last ended. So you might be thinking that my Nats trip was a disaster after dropping so early. Quite the contrary in fact, I had a blast. While I was saddened by my mistake I made the most of it and indulged in pure Yugioh madness. First of all I got pretty decent prizes for… well just showing up actually (not the card though, I bought that). Now these may not seem like much, but the whole event people were trying to buy and trade for them. The vendors were offering $65 for the mat, die and sleeves. Some of the better Millennium items like the Puzzle were selling for even more. One of my friends opened a misprinted gold Puzzle which he sold for $150! I also entered a few side events! I entered a $2 Duelist League tournament, but it started without me. Annoyed I entered another one (receiving an entry card for each attempt) and got to have some meme matches with my beloved True Draco deck. My opponent was the girlfriend of a guy I traded with earlier while wondering the venue. He was cheering her on along with her other friends during the match. She did not seem to know what she was doing playing a burn focused Trickstar deck with Contract with Don Thousand. I beat her game 1, but our game took forever. Game 2 she used Trickstar Reincarnation to banish all of my Draco monsters, but Dinomight Knight preventing me from actually closing the duel so we drew in time as she had much more life. I 2-0’ed this guy so fast that we kept playing for fun afterwards until he finally beat me with Waking the Dragon (which I had no outs to the Raid Raptor Ultimate Falcon). At the time of writing this I haven’t played it since. The high point of the weekend was watching the incredibly bizarre Voice Actor duel between Jean Claude Magnum and Zigfreid Von Schroeder. Yeah you heard that right. The guy who lost to Mai Valentine in ep 80 and never seen again vs the villain from the filler arc who tried to hack Kaiba’s computer. Somehow they were able to make this a very engaging, funny and epic duel. My friends all scrubbed out and we went home. So I should close this nonsense by giving a final explanation of what I learned. I didn’t enjoy playing Yugioh after Master Peace got banned and I couldn’t win anymore. I only enjoyed hanging out with the friends I made through the game (and still do) because I really enjoy these people. Yugioh is a part of my life. I’ll never truly quit it (at worst I’ll keep playing Duel Links on my phone) . I also don’t want to risk the friendships that the game has given me. So I’ll keep my True Draco deck or some other semi-functional jank deck together that can steal a game off a meta deck if the stars align. Maybe if the game got cheaper, the format became less stale or they printed a new archetype that I wanted to play I’d be more excited, but right now the future seems pretty bleak. Granted as I write this, it’s the off season with no events, but I can’t see myself running back to competitive Yugioh even when they finally reprint Ash Blossom as a tin promo finally crashing her insane price. Oh and as for the EOM procedures, the Yugioh community despite hating them have gotten used to them now so there’s no reason to really complain. The format has shifted to decks that can win while wasting time (Gouki) or deal at lot of damage quickly (Trickstar Sky Striker). This has just made life harder for trap card based decks, which doesn’t do me any favors since I like playing those type of decks. Why are cards games dead for me overall though? Well it’s pretty clear that the only ones I play are Yugioh and Magic. And I realized long ago that I was only playing Magic because I had a few friends who played it. If my buddy doesn’t go to Friday Night Magic I don’t go. It’s that simple. I never edit my deck except for an hour before heading to FNM. I never even bothered to learn my deck’s own combos because I really don’t care. I’ve lost many games of Commander due to simply not knowing how to win. And even if I stop playing Yugioh there’s no reality that I would replace it with Magic. To be clear I feel the same way I do about Goats as I do with playing Commander with my friends, it’s a blast and I enjoy it. That being said I have even less desire to play against strangers or even consider playing it competitively. 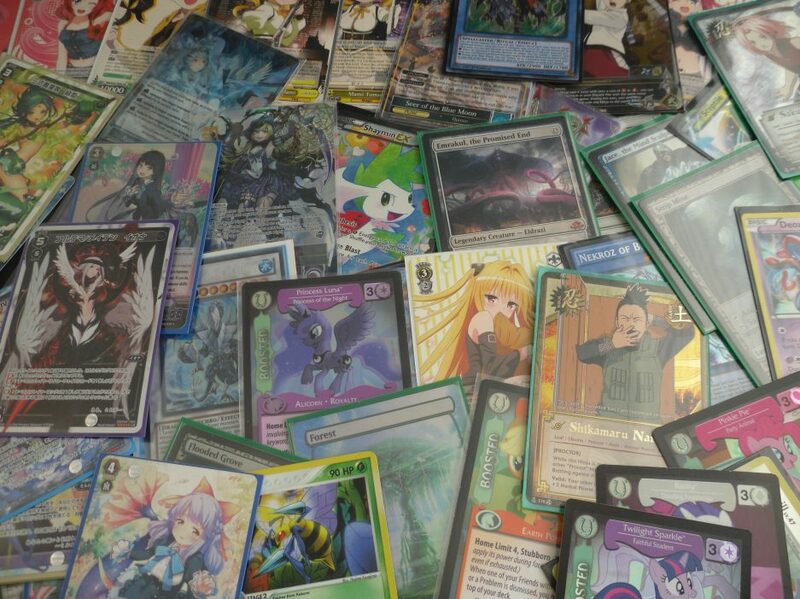 Also I realized recently that for too long my life as been completely linked to trading card games. That’s all people would say there is to me. That upsets me now and makes me want to change myself… or at the least try to. Nothing is 100%. Maybe I’ll want to play competitively again when Ash is a tin promo, or when Firewall Dragon is finally banned (Decode Talker is the real Vrains ace monster after all!). But at the moment I’m going to try and find a new direction for my life. I’ll still have decks to play, but it’s no longer something I’m really actively thinking about. I don’t expect anyone to have read this far (nor do I really want anyone to). Though if you did thank you sincerely for patronizing this blog which many times I did want to make into a real thing. A mecca of many card games coming together because there is no reason you can’t love many of these games. But time drags on and what was once a fun use of time has now become a tiresome chore. I’m probably going to let the blog die this year. It’s not fun to write about something you have no passion for. Thanks for coming though. Especially if I change my mind and end up looking like an over-dramatic tool. Seriously though. October was a busy month for me due to adult life so I’m going to slam a bunch of event summaries and photos into this one post. I honestly wish I posted more, but here’s what I got. So I have to thank the tier 0 nightmare of Spyrals for one of the most fun Yugioh trips I’ve had in ages. Basically as I’m sure you know if you’ve come this far into card gaming chaos that they released a new Yugioh set called Circuit Break and that in this set there was a new card called Spyral Double Helix which propelled the Spyral deck from fun jank deck to tier 0 powerhouse. I had said Spyral deck and had for the first time in ages that opportunity to play a meta Yugioh deck. As you probably already know I flipped that deck on ebay immediately right before the set dropped. This funded my trip to New York City to hang out with friends, go to Sneak Peek and ultimately the Brooklyn Regional! I didn’t even open enough Altergeists to build a deck, but luckily that was a temporary problem. Being a prominent deck in the new anime I spent the weekend and the rest of the month trading/buying the rest of the deck. I would’ve done the same with the Rokkets, but many of them are Secret Rares so I’m hoping to wait until the Special Edition comes out to lower their prices. We entered a sneak tournament where my buddies played each other in the finals (we bamboozled the store by having one friend scoop so they could play for the mat later (and let us leave to get dinner). I got to play against a youtuber (Davinator212) with my Zoodiac Stun deck (don’t try this at home kids). Regrettably I lost in time due to a misplay. He went on to lose this match and has been ripped on for it ever since. So due to an increasing disdain with modern yugioh I really got onboard when one of my mates said we should all play goat format. I don’t know if I ever brought this up before, but seems as good a time as ever. Basically goat format is yugioh with the 2004/2005 banlist so the games are glacially slow and reward slow card advantage and grinding. I can safely say these games have been some of my most beloved games of Yugioh. We played quite a bit of goat during the trip so it’s fresh in my mind. I was completely overwhelmed by what was at the time the best deck. My opponent made several misplays while his buddies hovered around him. Opened triple Ghost Reaper game 1, my set rotation lock was outed immediately by cosmic cyclone. My opponent was not very good, I went out of my way to win with Topological Bomber Dragon for fun. Between his bricks and my decent plays I managed to win. I was getting pretty tired at this point and I couldn’t focus during the duel. Once again the set rotation lock failed. I opened Oracle of Zefra thus making my combo dead. I got steamrolled. I Ghost Reaper’d his Dragon Buster both games. It was pretty anticlimactic. What this tournament taught me was something I already knew, but never took to heart. I could easily have competitive success in Yugioh if I actually cared to construct a complete deck. I’m not going to say I didn’t make tons of misplays, but after awhile you just get the flow of the game down pat. My deck held me back, but I still got 93rd place. Highlight of the Regional was definitely getting Italian pro player Marcelo Barberi’s autograph. In hindsight I wish I got a card signed, but I didn’t have a sharpie on me. My buddy told me that at the Thursday Standard Showdown for Magic that the attendance was so low that they would give us packs just for entering. I threw together a deck of the draft bulk I found at the store, bought a few more copies of Lord of the Accursed and tadah! Black-White Zombies. The mere fact I took a game off a real deck made my heart almost stop. In Oketra’s Name iss actually a really good card. I played my friend and actually won the match thanks to janky enchantments I sided in. And that’s about it for my October adventures is squandering precious resources on shiny cardboard. I’m going to a Yugioh Regional tomorrow so hopefully won’t take me a month to discuss what happened. I entered the Hour of Devastation 2-headed giant pre-release earlier today. I was sold on this set for its flavor and story (mostly established characters like the gatewatch getting owned), unlike Amonkhet which was the first Magic Pre-Release I had skipped since I started playing. This summary is going to be pretty brief also. My partner played Green/White Midrange and I played Red/Black Control. MVP of my deck were the 4 copies of Open Fire. We started out in the standard sealed boardstall. They cast Unconventional Tactics on Wildfire Eternal which hit us allowing them to cast Approach of the Second Sun for free. We tried to race the Second Sun, but they stalled us out by combining Crested Sunmare with Mirage Mirror to make an army of indestructible horses. Eventually they drew into the 2nd sun and a 7th land defeating us. I messed up this round and thought that Without Weakness could be used on any creature. I used it (2 of them in fact) to protect our Crop Elite from an Open Fire and an Invocation Slaughter Pact. None of us released this error for 2 turns and by then he had a huge lead. I should also point out that despite being Esper, our opponent never drew into land other than Swamp. The Red/Green player kept a 1 lander and never drew a 3rd land. Our opponent’s only creature was the Maruading Boneslasher which could never block so we just kept attacking them. We won 6 packs, opened nothing to really warrant writing about and went home. This set is very cool in terms of flavor, not so much in terms of monetary value. Regardless it was at the least an interesting experience.